Microsoft Office 2007 Support has ended. What are your options now? Since October 31st, support for Office 2007 has completely ended including the extended support that Microsoft had provided. While most applications within Office 2007 will continue to work, applications like Outlook 2007 are unable to connect to Office 365 mailboxes. More importantly, the last security update for Office 2007 ended on October 10. With well documented exploits already available to would be hackers and impending GDPR regulations on the horizon, it is imperative that if you're still operating on Office 2007, upgrade. 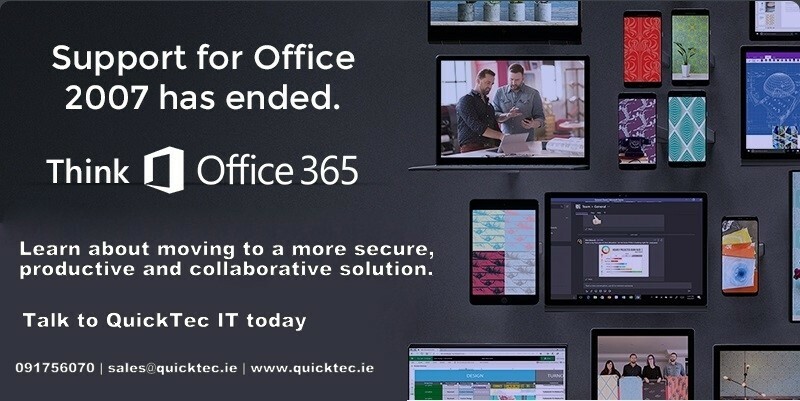 It's time to move to a more secure, productive and collaborative solution.